LOS ANGELES—On Friday morning Robert D. Skeels, candidate for Los Angeles Unified School District (LAUSD) School Board, and Yoon Jung Lee, Evans Community Adult School student leader, along with members of the Korean American community will hold a press conference in front of the Korean-American Education Foundation. The press conference's main topic is how the incumbent school board member closed all of the LAUSD adult schools in Koreatown, robbing the Korean American community of one of its most treasured local resources. The location is at the site of one of the shuttered schools. The press conference will be held in English and Korean. The press conference has been called in response to news that the incumbent's campaign has begun advertising in Koreatown and has started making phone calls to the Korean community on the heels of receiving support in the form of an one million dollar donation from an out-of-state donor. "Korean Americans have begun getting phone calls telling them to support the incumbent. 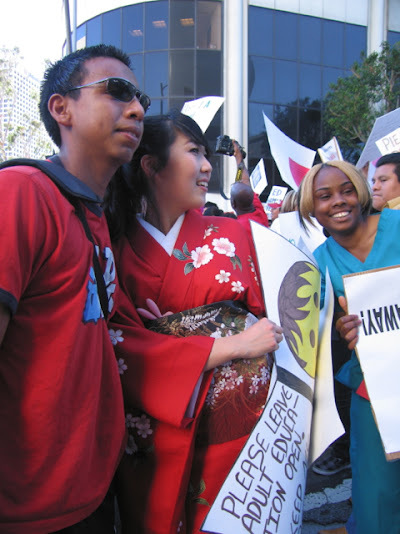 We want to remind the Korean community that just last Spring Mónica García callously shut down all three of the adult education schools in Koreatown, depriving an immigrant community of much needed English, citizenship, and other important classes. This has had a drastic effect on the residents of Koreatown, and has especially harmed senior citizens. Our campaign believes Koreatown deserves better, and encourages everyone to vote for Robert D. Skeels for school board. He is number 187 on the election ballot." The Robert D. Skeels for School Board campaign has vowed to reopen at least one adult school in Koreatown, and advocates for both Dual Language Immersion programs and Korean American studies in K-12 schools. Robert has also promised that he will hire a Korean American to his LAUSD staff to finally provide the Korean community with representation in the district. 2013년 2월 15일, 한인투표자들을 위한 엘에이 교육위원 선거에 대한 기자회견이 있습니다. 한국인 투표자들에게 누가 코리아타운에 있는 모든 성인학교를 닫았는지를 기억시키기 위해서 기자회견을 합니다. 에반스성인학교 학생인 이윤정, 그리고 코리아타운 지역회원들이 한국교육원 앞에서 기자회견을 합니다. 기자회견의 주요내용은, 현재 교육위원은 코리아타운내에 있는 성인학교를 모두 닫았고, 한인들의 아주 소중한 학교를 빼앗았습니다. 이에 대해 한인투표자들에게 기억을 되살리기 위해서 입니다. 기자회견하는 장소는 문을 닫은 성인학교 가운데 하나이며, 영어와 한국어로 할 것입니다. 이번 기자회견은 현재 교육위원이 코리아타운에 살고 잇는 한인투표자들에게 선거운동을 하는데 잇어서 대처하기 위해서 입니다. 현재 교육위원은 다른 주에 사는 선거기부자의 1-밀리언 달러의 돈을 가지고, 한인투표자들에게 전화로 선거운동을 하고 있습니다. 한인투표자 여러분, “모니카를 투표해주세요.”라는 전화에 속지 마세요. 우리들은 작년 봄에 그녀가 코리아타운내에 있는 모든 성인학교-특히 이민자들을 위한 영어, 시민권반, 다른 중요한 프로그램-를 닫았는데 대해서 기억을 해야 합니다. 이것은 우리 한인들에게 나쁜 영향를 끼치고 있으며, 특히 우리 어르신들에게 아주 나쁜 영향을 주고 있습니다. 우리들은 유일하게 엘에이 교육위원, Robert D. Skeels (로버트 디 스킬즈) 만이 코리아타운의 교육을 살릴 것을 확신하고, 우리 한인들의 권리를 찾을 수 잇을 것이라고 믿습니다. 한인투표자 여러분, 투표번호 187번, Robert D. Skeels (로버트 디 스킬즈), 엘에이 교육위원을 투표하십시다! Robert D. Skeels (로버트 디 스킬즈), 엘에이 교육위원은 다음과 같이 한인투표자들에게 약속을 합니다. 코리아타운에 적어도 하나의 성인학교를 다시 열것이며, K-12학교에 이중언어프로그램 활성화와 한국문화를 배울 수 있는 프로그램 신설, 그리고 한국인 직원을 채용하여 코리아타운커뮤니티와의 원할한 소통과 정기적인 만남을 추진할 것입니다. Robert D. Skeels (로버트 디 스킬즈)는 엘에이통합교육2지구(코리아타운, 히스토릭 필리피노타운, 에코파크, 링컨하이츠 포함)에 18년동안 살면서 보다나은 공교육향상을 위한 운동에 참여해 왔고, 교육전문가로써, 작가로 활동하고 있습니다. 그의 한국인 부인, 이윤정은 '성인학교살리기 운동'에 참여해 왔습니다. 또한 Robert D. Skeels (로버트 디 스킬즈)의 선거운동에는 많은 지역사회 자원봉사자들의 지지를 하고 있습니다. 그는 유일하게 선생님연합회(UTLA)와 교장및관리자연합회(AALA)의 지지를 받은 유일한 후보자입니다. 그 밖에 여러 교육단체의 지지를 받았고, 전교육부장관이었던 다이안 라비치교수의 지지도 받고 있습니다. Robert D. Skeels (로버트 디 스킬즈)를 위해, 지역이민단체들, 선생님들, 지역사회학부모님들, 그리고 가족들이 선거운동을 돕고 있습니다. 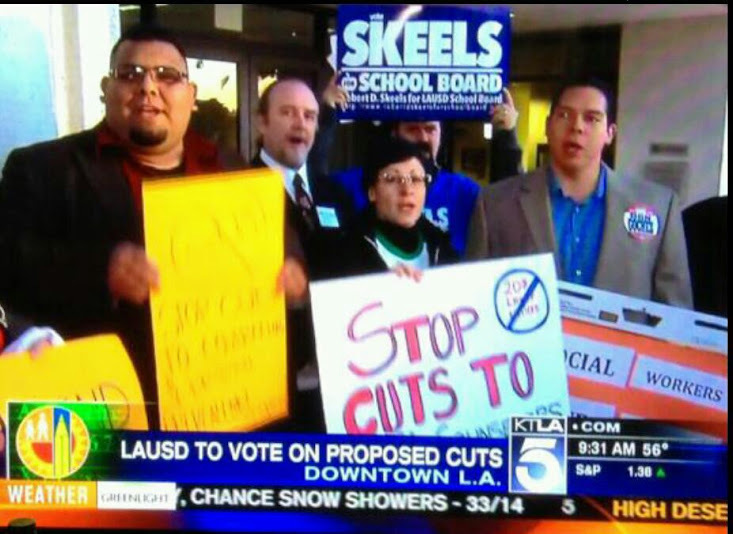 Robert D. Skeels, candidate for Los Angeles Unified School District (LAUSD) School Board, stood with counselors, psychiatric social workers, school psychologists, and teacher librarians demanding LAUSD leadership vote no on depriving our students of 208 desperately needed professionals. The demonstrations were on Monday evening and Tuesday morning. Los Angeles City Council CD9 Candidate Ron Gochez was on hand as well. The community candidates support the community. Mr. Skeels also brought the topic up during the District 2 candidate debate on Monday evening. On Tuesday, under pressure from community activists, the board decided to vote against cutting services for our students. LOS ANGELES—On Monday Robert D. Skeels, candidate for Los Angeles Unified School District (LAUSD) School Board, will stand with counselors, psychiatric social workers, school psychologists, and teacher librarians demanding LAUSD leadership vote no on depriving our students of 208 desperately needed professionals. "For LAUSD to consider eliminating these position, vital to our students is unconscionable. On the heels of a national tragedy, and recent revelation by the The California Endowment that two-thirds of Californians surveyed said they would choose putting a counselor in every school over having more armed security, the district's decision couldn't be more out of touch with the communities it is supposed to serve. Many of us worked hard to pass Proposition 30 in order to avoid these damaging cuts. Our students deserve so much better than this. We need more school librarians, counselors, psychologists, and social workers, not less. More insulting is the fact that the Board will be voting on a plan to give away $50 million in iPads on the same day that they are voting to cut indispensable professionals who directly serve our students. According to research cited by Dr. Stephen Krashen 'ebooks only account for one-half of one percent of school library collections, and this is predicted to increase to only 7.8% in five years.' Rarely mentioned in iPad discussions is cases where this costly experiment has been tried, it has failed. Honywood Community Science School in Essex England spent £500,000 on iPads, and reported that more than half were broken within a year. With these two things in mind, we should be skeptical of calls that such expenditures will provide 21st century skills, which often amounts to students playing Angry Birds or using myspace. Once more we see our district's highest level decision makers putting corporate greed in front of student need. This is one of the reasons my community asked me to run for school board, because they are tired of policies and budget priorities that put our students last. We demand that LAUSD retain the professionals who provide our students vital services." While I support the intentions of the possible lawsuit, let's bear in mind two things. First, Los Angeles Unified School District (LAUSD) is actually pretty good at talking about providing English Language Learners (ELL) resources. Many of our own local teachers and administrators played a major role in writing the new English Learner Master Plan. Further, I'd like to know if LAUSD's 2% cited by APALC and the ACLU desegregates public schools from privately managed charters, since we know the latter are far more prone to under-serve ELL students. Moreover, the suit seems to be more about other districts that have abdicated their ELL responsibilities altogether. Second, we don't want ELL to be considered a means for dropping core courses taught in heritage languages. Members of the Nonprofit Industrial Complex (NPIC) were using phrases like "fast track to reclassification" when the new master plan was being crafted. This is wrongheaded. We want to provide resources for students to learn academic topics in their heritage languages concurrently while they are in the process of English language acquisition. While a novel concept, many are discussing this topic speak as if English is the only language in which subjects like mathematics can be learned. The rest of the world is proof positive that this isn't the case. There are those that would substitute ELL programs for highly successful dual language immersion and academic courses being taught in heritage languages, we want APALC and the ACLU to recognize and discourage that practice by advocating for heritage and dual language programs as well as equal access to ELL.